#9 Matrix within Matrix. Part 2. Neo. 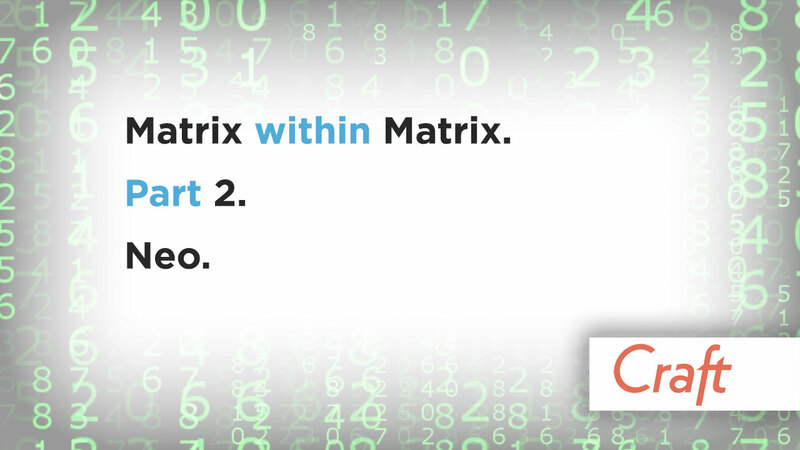 Please check out part 1 of this mini series on Matrix within Matrix. It gives some background on the problem, and covers the incredible SuperTable plugin. The technical problem we are solving here is that you cannot have a Matrix within a Matrix out of the box with Craft CMS. By making this possible it allows us to create very powerful content options without the content editor or publishers not touching HTML at all. This is an absolute god send. Whilst of course us web designers and developers can add classes and markup blindfolded, your typical every day content editor doesn’t know HTML well. Craft CMS Development and NEO comes to the rescue here. We are not living in the days where you copy and paste massive chucks of HTML into a single custom field. Those days are thankfully very much behind us! You can nest within nest and even nest again using the Child Blocks option in Neo. However it’s not something that i’d recommend. I will cover this in depth in part 3 of this series, look out for that! This is a handy feature which restricts the number of total child blocks across the whole NEO custom field. If you have similar content between blocks, then you can duplicate them to save time. Another well thought out and very useful feature of Neo. Out of the box a Craft Matrix re-saves every block within that Matrix. If you have dozens of fields then this can take a lot of resources, meaning it takes a while to save. Ben (author of Neo) has built in a superb feature in which the Neo field detects what is new and only saves the newly created content within the fields. Clever stuff! This is definitely 1 of these ‘game changing’ plugins that comes along only so often. Praise has to to go to Ben for creating this superb addition to the Craft family of plugins. Whilst you probably won’t use it on every project you build, it’s another tool in your armoury for building complex layouts, with the editors being able to create them with only click buttons and adding content. I can’t imagine how much work this was for him. Huge Kudos. Pixel and Tonic also deserve a mention here, as without creating a solid underlying framework none of this would be possible. This plugin really takes Craft CMS to a new level. Download NEO now, you will not be disappointed. What are your experiences with using Neo or Super Table? P.s: Watch out for part 3 of this series which will cover some of the caveats of using Super Table and Neo.